The release of version 8 of Veeam Backup & Replication is adding new important features that can be used in the Modern Data Center. Veeam Backup Free Edition will also be adopting some of these new features that can be used in a production environment. Veeam Backup Free Edition will gain NetApp integration, Veeam Explorer for Active Directory, Veeam Explorer for Microsoft SQL Server, and Encryption. Here is a rundown for what's new for free. The release of version 8 of Veeam Backup & Replication has added integration with NetApp Storage Snapshots. This feature is included in the free edition and can be used to recover from any snapshots (not limited to those created by Veeam) and supports any level of recovery from both primary storage SnapShot, SnapMirror and SnapVault! Storage snapshot allows you to take copies of the state of a storage volume at a point in time with minimal impact on production environment and as often as you like (offering the best RPOs), and with the Veeam Explorer you can instantly recover from those snapshots for the best RTOs. Veeam Explorer for Storage Snapshots has a variety of restore options including instant restore of an entire VM, restoring guest OS files, Microsoft Exchange mailbox items, Microsoft SharePoint documents, SQL Server databases and Active Directory objects. Indeed, this powerful feature is included for free! Check it out below! 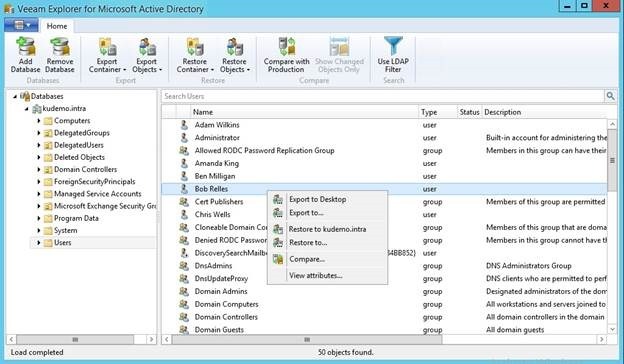 To ensure for high speed recovery of critical application items, Veeam has introduced Explorer for Active Directory. Like every other Explorer in Veeam Backup Free Edition, it can be launched from the File Level Recovery session that looks inside of the file system of the VM that has been backed up with VeeamZIP (the backup taken with Veeam Backup Free Edition). This feature allows you to open and look through the Active Directory database file (ntds.dit) and restore individual user and compute accounts, or groups. Paid Veeam Backup & Replication editions additionally provide user and computer account's password recovery, and restoring of multiple objects with a single click (for example, entire container restore). The screenshot below gives you a look inside the Explorer. Veeam Explorer for SQL Server allows for one-click database restores directly from backup, without having to extract an entire VM first. When looking to restore, the Explorer will mount the VM image from selected VeeamZIP backup, and allow you to restore the individual databases. The image below shows how database recovery can be initiated with the Veeam Explorer for SQL Server. Paid Veeam Backup & Replication editions also include point-in-time restore down to a specific transaction. Many organizations have data that needs to be protected and encoded for security purposes. With Veeam Backup Free Edition you are able to encrypt your data by just adding a password. 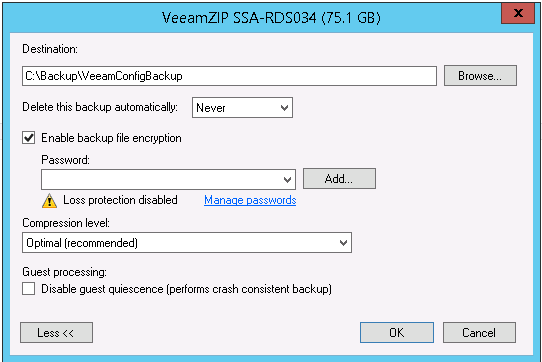 The backup encryption feature is found in the VeeamZIP backup window which is shown below. By checking the box, “Enable backup file encryption” and then adding a password, you will be able to encrypt your data. Veeam uses AES 256-bit, which is the gold standard algorithm for encryption. Those of you with a keen eye will notice an added dropdown called “Delete this backup automatically”. This is called VeeamZIP auto-retention. This feature will allow you to automatically delete your check point backups after three days, a week, or a month. This solves the problem of having backups you may have forgotten about left on disk and taking space. How cool is that!? Veeam Backup Free Edition includes 13 features that can be utilized in the Modern Data Center, and you can also keep this in your arsenal of tools. These features allow your data center to have a solid backup and recovery process, even if you have a low budget.